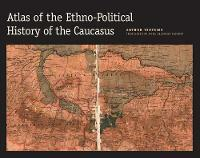 The Atlas of the Ethno-Political History of the Caucasus is a magnificent collection of fifty-six original maps with commentaries that detail the ethnic, religious, and linguistic makeup of the Caucasus—the region located between the Black and Caspian Seas that contains Europe’s highest mountain—from the eighteenth century to the present. The highly detailed maps and text untangle the exceptionally complicated history of this area, poised between Europe and Asia, which has been marked by ethnic conflicts and changing political borders. The Atlas illuminates the conflicting historical visions of homelands and borders, and provides a comprehensive reference tool for scholars, geographers, and historians. Arthur Tsutsiev is the senior researcher at the Center for Social Studies at the Vladikavkaz Institute of Management. He lives in Vladikavkaz, Russia.